This page is USA TODAY Sports’ “4th & Monday” newsletter. Sign up here to get this delivered to your inbox every week to catch up up on the latest news, the best analysis and more from around the NFL (and any other leagues that might try to form and then fold). Get it here! The sporting calendar is creeping ever so closely to draft day. It’s that magical time of year when every first-round pick is a potential generational talent with the ability to change a franchise’s fortunes for years to come. 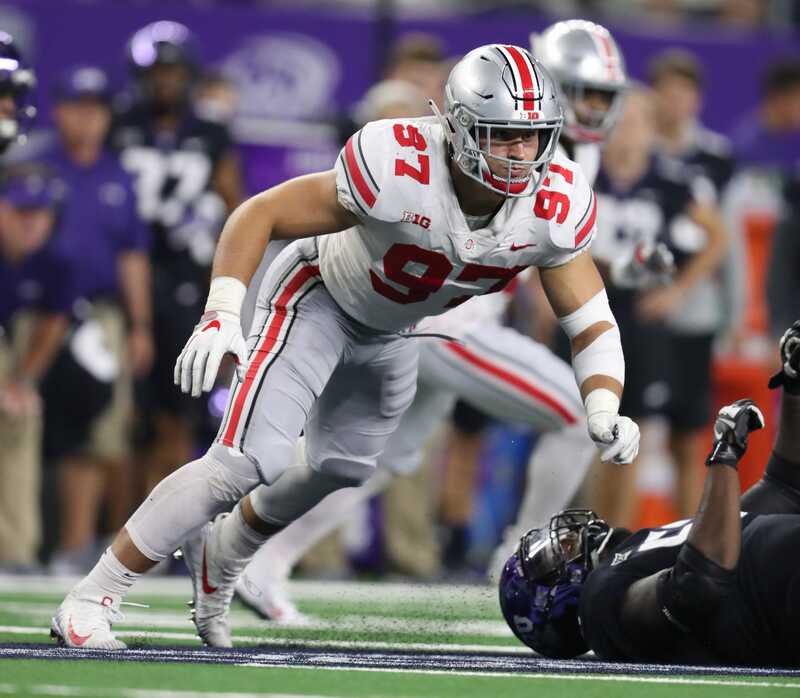 One of this year’s top draft prospects, Nick Bosa, could be one of those franchise cornerstone talents. He was in the news this past week for things unrelated to his football abilities. While we’re on the draft, here are the top five eligible prospects at each position and the eight teams most likely to trade up or down to change their draft fortunes. The preseason slate was released last week. The regular-season schedule could drop this week, as the NFL traditionally has unveiled its schedule the week before the draft. What is your guess for the number of prime-time nationally televised games for the Cleveland Browns? – 100 biggest draft busts ever: From Ryan Leaf to JaMarcus Russell and more, the NFL draft has an extensive history of top picks who would only be remembered as busts. – Robert Kraft gets standing ovation: The New England Patriots owner was seated with Boston Celtics owner Wyc Grousbeck and got a loud ovation when shown on the Jumbotron. – Eagles, Wizards players arrested after D.C. fight: The Philadelphia Eagles’ Jalen Mills and Washington Wizards’ Devin Robinson were arrested and charged with disorderly conduct for fighting outside a Washington D.C. nightclub early Saturday. – Manziel: ‘Single goal’ is to make return to NFL: Speaking of draft busts, John Manziel — yes, you read that right, John Manziel — says his focus is making an eventual return to the NFL. – Packers icon passes away: Forrest Gregg, the player Vince Lombardi called “the finest player I ever coached,” passed away Friday at the age of 85. Gregg won five NFL championships with the Packers in the 1960s and was named to the NFL’s 75th anniversary team. – Diversity group at critical juncture for NFL: With the NFL facing diversity questions, the Fritz Pollard Alliance is in search of a new executive director after John Wooten retired from the role. – Redskins LB reinstated by NFL: Reuben Foster will be fined two game checks but has been cleared to play in the NFL for the first time since his arrest last November. There are just 10 more sleeps until the 2019 NFL draft. – Trade talk: These are the eight teams that are most likely to trade up or down during the 2019 NFL draft. – Top 5 prospects at each position: Reporters from the USA TODAY Sports Network rank the top five players at each position. – Latest mock draft: We’re just a few weeks away from the NFL draft and our latest mock draft asks if the expected first-round QBs are starting to slide. – 10 prospects who could be better as pros: Having a prolific college career isn’t a prerequisite for an outstanding NFL run, and these 10 draft prospects could be better at the next level. – 10 prospects you don’t want to miss: These guys weren’t major standouts in college. But they could prove to be stars in the NFL. – Under-the-radar prospects to watch: Looking for some of the best values in the 2019 draft class? These prospects should be huge bargains in the middle and late rounds of draft weekend. – Draft value chart: Ever wonder how teams pull off draft day trades so quickly and efficiently? Well, there’s this chart that functions as a guide for teams when swapping picks. – Draft diary with Easton Stick: The North Dakota State quarterback prospect wasn’t even sure if he was going to be able to hold his pro day, but a last-minute solution cleared things up. – 23 prospects will attend draft in Nashville: Regardless of whether he’s the No. 1 overall pick, Kyler Murray will be on the scene in Nashville whenever his name is called. – Draftville podcast: We’ve got team of experts across the country who will join us each week to keep you updated on the all the moves, expectations and strategies. Join the conversation in our NFL Facebook group! If you love talking football, we have the perfect spot for you. Join The Ruling Off the Field to engage in friendly debate and conversation with fellow football fans and our NFL insiders. Want to keep this football conversation going? Head to Facebook, and/or give a Twitter follow to your friendly neighborhood USA TODAY Sports football guy who put together this newsletter, @jimreineking.